Popsicle Sticks and Electrical Trunking! 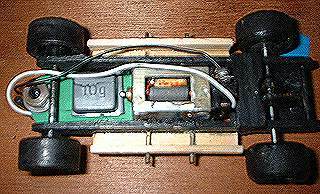 I don't normally allow non-metal slot car chassis on this website, but when Graham Windle wrote to say he had made chassis of wood, popsicle sticks and even electrical trunking, I just had to see them! Now you can see them, too. Thanks again, Graham! Graham wrote: "Yes, wooden chassis! I built these popsicle stick-type cars and we are currently holding an event at Pendle for them." 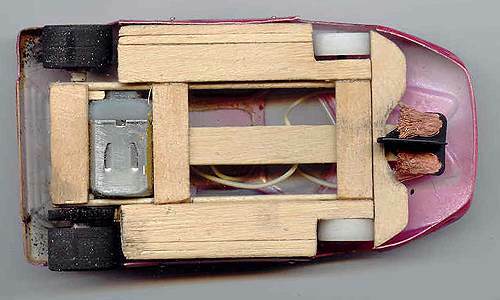 "The original creator of popsicle stick slot cars is Al Penrose, and I saw the idea at Al's website. 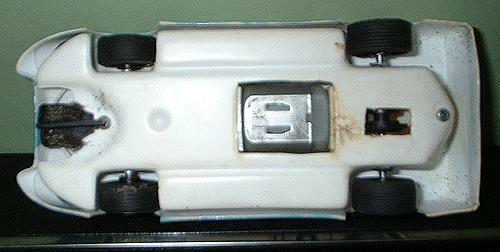 Of course, slot car racers have been scratchbuilding chassis and bodies from balsa wood and obechi for a long time. But Al's popsicle stick cars are a great idea and an easy method for building a good handling wooden slot car chassis." "Here's another, an inline. As a matter of interest, the popsicle car is just as quick 'round Pendle as a similar-powered Proslot Porsche gt3, but is a lot easier to drive!" "Here's a chassis made from electrical trunking. I think you'll like this one!" "Here's a photo of a plastic scratch build. I vac-formed the chassis from a mould I made. The body is a vac-form clone of a Strombecker J Ford. The chassis is moulded from 60 thou. plasticard, and the body from 30 thou."